Scene from A Crack in the Noise. Photo by Echo McIntyre. 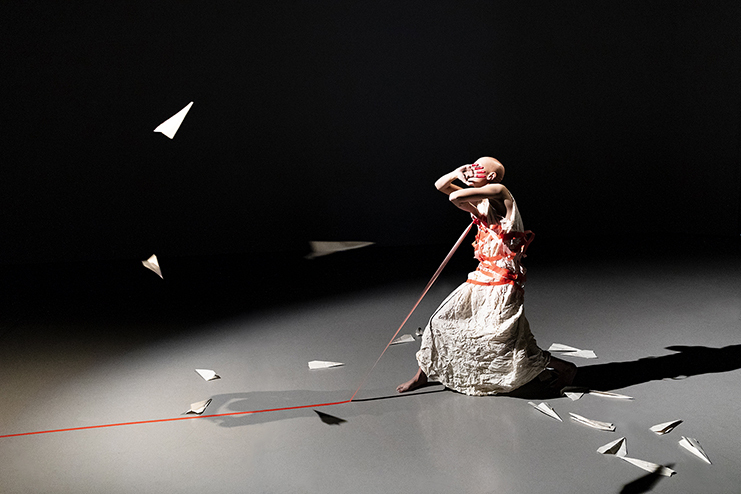 Almost 20 years ago, visual and dance artist Veronica Lee-Baik founded a modern dance company called The Three Yells, and since then has combined art and dance to highlight current events and important social topics. That goal, combined with her desire to integrate multiple artistic disciplines into her dance performances, inspired Lee-Baik to create and direct a company of her own. “My dedication to art, dance and desire for representation, along with taking breaks in between works to rejuvenate myself and my mind are what has kept me going,” she said. Lee-Baik has earned accolades for her work. In 2017, she received a James W. Ray Venture Project Award from Artist Trust, as well as numerous grants for previous productions, and The Three Yells is currently receiving support from 4Culture. All this effort stems from Lee-Baik’s fervent belief in her mission. “Hopefully to have created a work with thoughtfulness and emotional impact, so viewers reflect on issues related to refugees and immigrants, and to iterate that a refugee and an immigrant is like any other human being,” she said. “A Crack in the Noise” runs February 1 and 2 at the Cornish Playhouse at Seattle Center, 201 Mercer Street, Seattle. Tickets available here.